Boo! Halloween is just around the corner, which means there’s a lot to be done for fun themed parties and, of course, making treats for the trick-or-treaters. To prepare for the ghoulish festivities next week, look to our Entertain & Celebrate Halloween issue, on sale now. It has tons of pumpkin-styling and party-decorating ideas to make the next bash for the young and young-at-heart a success. It’s the perfect resource for your last-minute planning needs. Not to mention, it has all the scrumptious sweet and savory Halloween-themed recipes that you could possibly desire! Chocolate Peanut Butter Sandwich Cookies with a spooky cat outline, Candy-Coated Apples, Turkey Sliders with Pumpkin Aïoli, Brownie Owl Cake Pops, Pimento Cheese Ghosts—there’s too many yummy snacks to list! 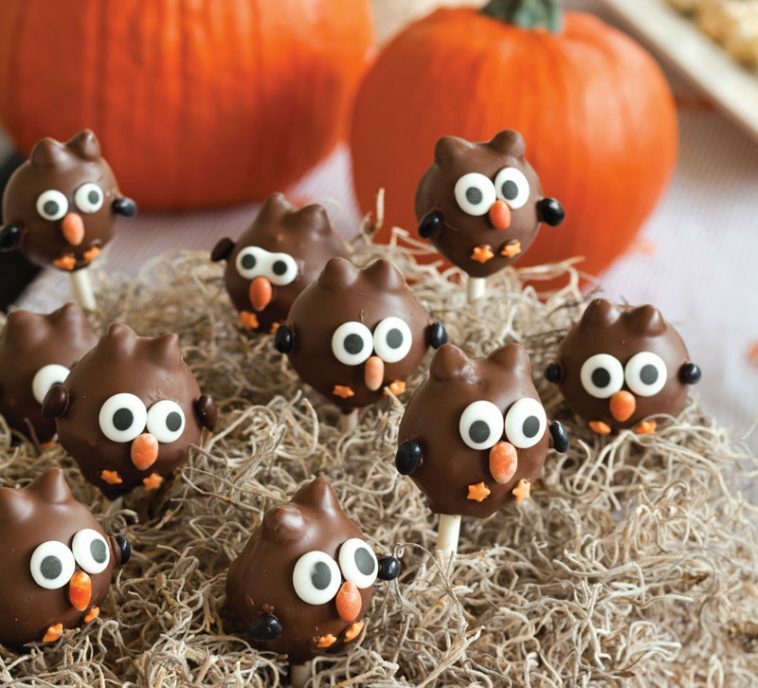 It’s always fun to make creative snacks for your trick-or-treaters so I’ve included the recipe for the Brownie Owl Cake Pops below. They’re perfect to slip in a little bag and tie up with an orange ribbon! Right about now, I could go for a warm cup of Butternut Squash Soup served with Pepita Pesto made from roasted pumpkin seeds. Such a fun time of year, fall brings beautiful autumn leaves, great breezy weather, and creative holiday décor. And don’t forget about decorating your pumpkins! If you are all out of pumpkin-carving ideas, then look no further. 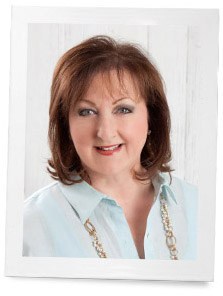 This issue has some neat projects to try like melting crayons to drip down the gourd’s groves. I don’t know about you all, but the Ghost Cake on the issue’s cover looks stunning! Whimsically designed with googly eyes and a black cat silhouette perched on top, it would be a great centerpiece for your party table. 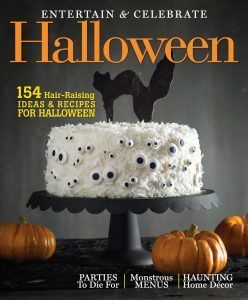 Get the issue and get to making all these Halloween treats! Before we know it, Thanksgiving will be here, and that’s a whole other menu we need to plan. Prepare brownie mix according to package directions. Preheat cake pop maker according to manufacturer’s instructions. Bake cake pops according to manufacturer’s instructions. Remove from cake pop maker, and let cool completely. Insert 1 lollipop stick in each brownie pop; set aside. In a microwave-safe bowl, melt candy coating according to package directions. Carefully dip each cake pop in candy coating, letting excess drip off. Before each cake pop dries completely, place 2 chocolate morsels for ears on each owl, pressing gently to adhere. Secure cake pop into florist foam or a cake pop stand to dry. Once dry, dip once more to coat completely. Using tweezers, place chocolate-covered sunflower seeds, candy eyeballs, and sprinkles to decorate, if desired. Let dry completely. Store, covered, at room temperature for up to 3 days. Note: We used a Babycakes Cake Pop Maker. *We used CandiQuik, Wilton Candy Eyeballs, and India Tree Matisse Sprinkles. Love the cute owl pops and the eye coconut cake. Looks like a really neat magazine issue. What a fun magazine. I will be looking to purchase the magazine. This magazine seems like it is full of great ideas. Thank you fro he recipe. It sounds delicious.